My apologies for the previous disappearance! In the absence of me paying attention, I have put on weight. A few pounds. Serious seriousness time - I have prediabetes now (high blood sugar but not yet diabetes). I've taken some annual leave to get a proper start on getting back into healthy eating and exercising. Having discussed with my doctor, we've agreed a sensible weight for me to aim for, that my body will be able to maintain... it's higher/heavier than I was originally aiming for on here but let's see how it goes. One of my family members had diabetes but got their blood sugar right down to the point where they no longer need medication, and that gives me hope. It comes down to regular healthy eating and exercising. One of my friends on social networking asked me recently, after seeing a photo of a cake I'd made for someone's engagement*, "Is there anything you cannot do?" and I replied "Yes, eating healthily and exercising regularly for any sustained length of time and it drives me mad!". I am here to try to prove myself wrong about that. Because it's already 2pm and I haven't eaten anything yet (terrible habit), I'm going to call tomorrow Day 1. Today can be prep day. Progress as of today: 0 lbs lost so far, only 20.6 lbs to go! Hi Trish......glad you found your way back! Hi Trish - so good to hear from you, although, I'm so sorry for the diagnosis. I want to encourage you on your journey - you can do this! The food pictures are a great idea! What is the recipe for the chocolate loveliness at the end? WELCOME BACK! nice to have u back in our ranks of DDers. What do you do for work that you can take leave ? I think this is a great way to get back on track - less work stress and more time to implement some healthy strategies. How long will you be on leave? I've got a week off! YAY My job is training people to be stop smoking advisors. I also see stop smoking clients myself ...and that's a bit of my job I can't really take 100% leave from because if a client contacts me needing some help or some meds then I still have to respond. I've warned them all that I'm on leave this week so emergencies only. Following 2 lots of antibiotics for a dental infection, I have had an unwelcome visit from the yeast fairy. It would have been wise to not eat any sugar at the weekend but it was my birthday on Friday and there was a trip out to a lovely restaurant then to a vegan ice cream parlour and when I came home hubby had a vegan chocolate cake for me in the fridge. PLUS I drank small amounts of alcohol at our Guy Fawke's outdoor party to keep me warm and I may as well have said "Come on in yeast, you're welcome, let me help you to multiply!! I did some researching for what to eat and not (because I was awake till 5am... itching) and so now I have a bowl full of some of the very limited number of things it's ok to eat if you have the yeast fairy visiting (it's even in my mouth! no smoochies!) Is it me or is it not a very long list? I have used all the stuff from the pharmacy (I had asked pharmacist could I eat specific food to help clear it up and he said "It's a bit late for that") which has burned a hole in my pocket. Would have been cheaper to get most of it on prescription but my doctor's surgery isn't open till tomorrow. I have probiotic capsules too. No sugar! Till this is gone. No sugar?!!!! Training people all day on Tuesday with no sugar?! Progress as of today: 1.9 lbs lost so far, only 21.7 lbs to go! Combat yeast with probiotics - you said it! Feel better soon! Nothing you write is TMI! you should read some of my nutty entries lol! I don't weigh either since weight fluctuates naturally, i do more by how my clothes fit. at least we learn the lesson and try not to make the same mistakes again! you have yeast in your mouth? can you explain just a little more? Lots of running around and working today even though it's Saturday. I'm training at least one day per week all through November and on the 3rd there's a large team gathering at my place of work for which I was asked to produce a quiz so I've been in an otherwise-empty office today getting printing done. Half of the quiz questions will be about smoking and stopping smoking, and half with be about cardio-vascular disease prevention i.e.exercise and healthy eating (those being the 2 things my workplace offers people help with, for free because of the NHS). If any of you would like to try the quiz then please let me know and I'll put it here as a post - however it does have pictures (multiple choice answers) and by your lack of comments to my posts with pictures, I'm guessing you're not that keen on pictures. Dinner: Tofu and vegetable soup with coconut and lime (home-made) with 23g of BBQ Popchips as a highly incongruous accompaniment - I've just been looking on their site and they show different packaging depending on which country you click to say you're in. Wooooow! I'm going to be here the rest of the day now, comparing popchip packaging! I love those smoothies but prefer to chew my veggies! When i drink liquid things, i find myself too hungry too early on. and also even if the smoothie has veggies, it is still all sugar. yum to chocolate :) lol....you are funny! soup sounds really tasty. and who doesn't like chips! i actually rely on one brand of veggie chips (because it's the lowest calorie brand i could find!) where it's 38 or so chips for only 130 calories. decent. and the chips are huge. Sugar-free Sula Fruit Mix boiled sweetie/ hard candy (lemon) - I don't think a bit of sugar is necessarily evil but my teeth do. 8 calories - but since I'm not counting any other calories this isn't really relevant. it's ok to have a small chocolate! everything sounds good. i used to be hooked so much on ginger tea myself! i would sweeten it with stevia (no cals). Well I am glad to hear you are beginning to feel better :) Welcome back!! Looks like you are doing well. I would like to see the quiz and if I'd not been out of town I would have commented on your posts with pictures!! I recently organized and purged my pantry. Rewarding! Also your red pepper and butternut squash soup sounds marvelous! 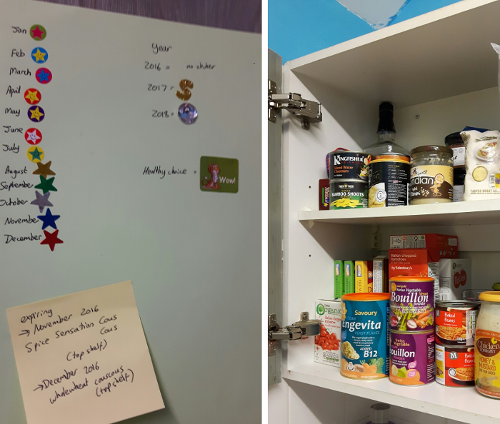 This evening I went through my cupboards and looked to see what had the lowest -> highest salt, sugar and fat. Also when things go out of date because I want to not waste things. Am still ILL but going to restart writing my food down tomorrow. This week I've been unwell - gum infection (improving thanks to the miracle of Flagyl and Amoxycillin cocktail) then a bad cold. My healthy eating has been on the backburner along with my low energy but today I'm trying to get back on track with it. 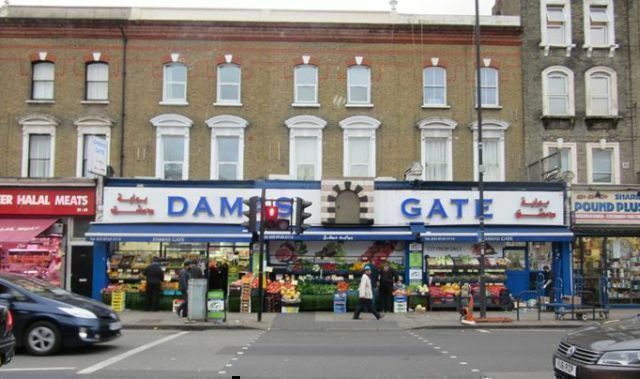 I thought I could do with some food inspiration so, instead of going to a major supermarket, I went to Damas Gate market which is across the road from the Doctor's Surgery where I have my Friday evening clinic. Consider me inspired! Look at all that fruit and veg out in front! Tonight for dinner I had red pepper and butternut squash soup, lentil koftas and fava bean salad - all of it home-made. Feel like I'm on the Vegiterranean diet! Bag of groceries for £3.16 too (almost exactly the same amount as dollars, thank you Brexit) and lovely lady who served me in the shop gently explained the difference between parsley and coriander so I knew how to pick the right one next time (and sent her colleague to swap the parsley I'd picked up for the coriander I wanted). I offered Mr Trish a taste of everything I made and he went 'mmmm' at each thing but then, to my 'would you like some?' it was 'no thanks'. More for me. People. I weighed myself and my arrow moved. A bit. It so very nearly moved the wrong way because I didn't read which box was for current weight and which box was for start weight. At my old job we were allowed to look at the internet whenever we wished - if the internet went down, productivity went up. Rumour has it that this rule was brought in after someone walked into the office of the head of the service and found him engrossed in Anna Kournikova's fan page. This didn't apply to me because, towards the end of working there, I always had more work than it was humanly possible to do so I ran away to join the stop smoking service on account of I'm not athletic enough for the circus. Congratulations on the loss! I laughed out loud at your post! Thanks for the humor! I always worked where it was OK to look briefly on breaks and my last job was too massively stressful so I retired (for now) - but I am going to keep the circus in mind! Congrats on the arrow's movement...all your doing, so be proud! i think it's fine to relax a bit at work, use the mind to write here & make comments too! Lots of love to you too & continued progress. I''m calling my diet 'DIY (do-it-yourself) regular and healthy and that's what I''m going to aim for to start out with. I'm going to aim to cook from scratch as much as possible also waste as little as possible in order to save some cash on food bills (I think we'll all get along loads better on here if I don't talk about politics but I'm in the UK and yeah, that). I'm going to start writing down what I eat here so I can keep a check on it. My friend on Facebook informs me that meals eaten between after 10am on a weekend but which are the first meal of the day are called 'Brunch'. Celery and tomato soup - home made (last night) - it tasted nicer than I expected, especially for not having very many ingredients. I left the seeds in the tomatoes. I had forgotten that tonight was the night for going out with a group of friends who we see only once a year and all go out to dinner together. We came back from a long, healthy walk and our friends were waiting outside our door. We went to Wimpy burger and all the veggie options had dairy in so I had scampi and chips which is terrible it's like mass murder, at least with fish and chips you've only killed one thing. Came home and hubby made me a vegan cheese and pickle sandwich which I'm eating now. Sound good that soup. Have a great day. wow all kinds of goodness in the food department. wishing you a great day. I have a great recipe for tomato celery soup! From an historic restaurant. Hope you had a good day! I haven't weighed myself yet - I read somewhere weigh every 2 weeks (or was it a month?) and we're a day or so short of that so I'll report back in a bit. I don't think I'll have lost much weight yet because I've been eating a bit more carefully but not started exercising. My jeans are less tight - that's a plus. Yesterday, among my group of training attendees, there was an Exercise Therapist who works at the local hospital. We were talking through ways to help clients cope with cigarette cravings and withdrawal symptoms and pretty much his answer to every thing was EXERCISE. It helps you sleep, it calms you down, it speeds up your metabolism,it speeds up the rate at which nicotine leaves the body, it's protective against depression, it reduces anxiety. As my lovely American husband would probably say... "I'd better get me some of that there exercise!". I have no excuses. Lazy isn't an excuse really is it. I've been trying to eat more healthily, making gradual changes. My sister has given up eating crisps (potato chips) in the run up to Christmas. She says Christmas can be 'Crispsmass' this year... it's less funny if I say chips. And I'm English/British so I say things like crisps, jam, through, thorough, though and tough and also my mum's voicemail message begins "Good Day to you!" Add cocoa powder - the regular stuff is fine or you can be posh and use expensive raw cacao which is the same thing spelled differently and costing 5 times as much yay! Not eating crisps is something I actually find harder. I think they are made to be as addictive as possible. The other night I was so desperate for crisps that I tried to make my own in the oven. This did not go well. Another source of joy over the past few days though has been my root vegetable soup I made and which is now all gone. Soups are things of awesome! I've got a can of creamed corn in the cupboard and keep meaning to make corn soup. I'm learning that filling up is no problem - what you fill up on is quite important though. Progress as of today: 0 lbs lost so far, only 23.6 lbs to go! Sounds like you are doing OK. Your sweet substiture drink sounds good. A little choc banana treat. Your drink sounds a lot like one I've made before: called a skinny shake. Banana, vanilla, almond milk, cocoa, Stevia, crushed ice - blend. Makes a nice shake! Agree that crisps are very, very addictive. i also agree that chips are addictive. Although, I include them in my diet quite regularly (usually instead of bread...i think to myself - "what's so bad about chips - it's just oil & potato). so i eat them pretty often with meals. i try for a brand that is pretty low cal so i can eat a lot of them. usually 1-2 servings and that is it. When I buy them I always buy single serve instead of a big bag. Mr Trish knows my favourite ones and they usually only come in a multipack. Single serve much better idea! I'm going to try to keep to the Crisp/Chip- abstinence for the moment and if I can be like the person who occasionally has a handful at a party but who otherwise isn't bothered by them then I'll be a happy Trish indeed. So, happily married me, now with an American husband telling me every day that I look beautful (I want to clone him so more people can have a copy now that I'm no longer polyamorous and can't lend him out), who is succeeding at my work, who is learning to deal with anxiety, who is happy with life .... has put on 40lbs since last we spoke. The also now 7 years older me doesn't care so much about what that *looks* like but cares more about carrying on being alive so I can enjoy my life and future. I tried a calorie counting site but I'm too busy to be weighing everything and found it hard to keep it up. Whereas I remembered all the fantastically supportive and helpful people on here and how writing stuff down got it processed and helped me to get healthier. So I'm back and going to glance just once at whatever graph or graphic they put in to show that 40lb weight gain, then look forwards. I'm not so used to the lbs thing. I think it's because we tend to do kilos now in the UK. Maybe it caught on because 'pounds' is also our currency. - *translation "The drinks are on you"
I'm having a go at being vegetarian (about a month now) and have not yet died as a result. If I get ill or find I'm missing anything major then I will, of course, take appropriate eating action. I think my body prefers being veggie - I was veggie for *counts* over 20 years before I started eating meat again in response to the low iron levels I got from eating hardly anything ever because I was really stressed one time. Am I allowed to be blunt about something? I'll whisper it ... I find it easier to poop as a vegetarian. It might be to do with vegetables having fibre, which you may spell fiber if you want. What's that? You're supposed to eat vegetables as well if you eat meat? Yeah, I know. I probably didn't eat enough of them. Thanks. Shall we stop whispering now? I have to start off exercising slowly because of the asthma fairy. That's just start off slow, I can build up to doing quite a lot. I forgot this recently and went from zero to half an hour of aerobics... not a good result. Preference for real food over sachets of gunk. If I wouldn't feed it to a toddler, a hungry person I cared about or to a beloved pet, I don't think it should be going into me. Not wishing to be down on powdered and reconstituted solutions of pink gunk for other people who want to use them but not for me. 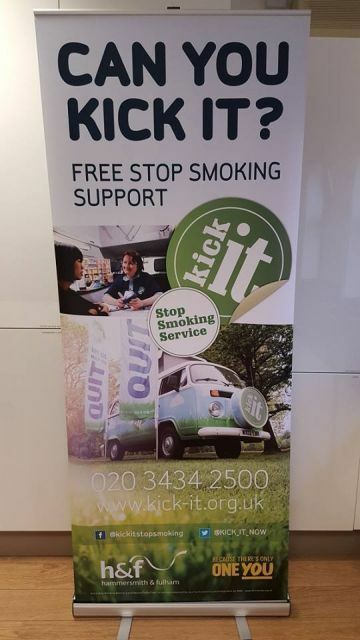 I'm actually very lucky in that my workplace (I don't know if I'm allowed to plug it) now runs a cardiovascular disease prevention programme as well as the stop smoking service. I'm eligible for the programme but .... it would be my (new) colleagues supervising my exercising and healthy eating in an official way and that's too weird and too much pressure. However a few of them have very kindly said they'll be happy to check in with me and answer questions about healthy eating and exercising. So very kind! I can pay them in home made cookies... they jog and eat celery and stuff so they're allowed. Progress as of today: 0 lbs lost so far, only 23.63 lbs to go! Hey Trish, I'm an American married to a Scot and live in the UK. I had to get used to using stone for weight, but don't like it at all. Definitely won't use kilos. I've changed my scale to pounds as that is what I'm used to. Welcome good to have you on the site. Good luck on your journey and all your life changing habits. Your picture is adorable :-) I look forward to reading more of your posts! Thank you! Looking forward to reading (more of) yours too. My hair is a lot longer than that now. Welcome back to DDs. I am recently back, myself. Sounds like a good plan. I am just doing what I can for now and not posting food, but I may later on. You speak of not being able to or want to eat very low carb - me too. These days, I have noticed plenty how the carbs generally tend to make me feel better. Except when i'm eating bananas at breakfast...they do make me feel good, but if i eat one, i am definitely hungry from a blood sugar drop just a couple hours later. Even if i eat the banana with protein and fat, no good....so i tend to have tea or an energy drink at the point when i'm at work...yeah. You have a very healthy approach eating real foods. Welcome to the site again! No judgement whatsoever from me on anyone's food choices. Small amounts of protein and lots of veggies yay!